At 7.30 pm sharp the family made its way into the dining hall. I looked around, scouring the table-tops for my name card and couldn’t believe my eyes when I discovered that the seating plan was no longer arranged strictly according to age! Granted, broad generational trends had been observed: my Oma was at a table with her eldest children, and the male under 21s were placed together. But for the first time, I wasn’t beside Cousin Maximilian, who seemed to have progressed to an ‘older’ table, on the other side of the room (and this in spite of being two months younger than me). No matter though. Any loss of identity I may have suffered from this departure from routine was immediately assuaged when I inspected the magnificent name tag that had been prepared for me by the very teenage cousins with whom I now shared my table. 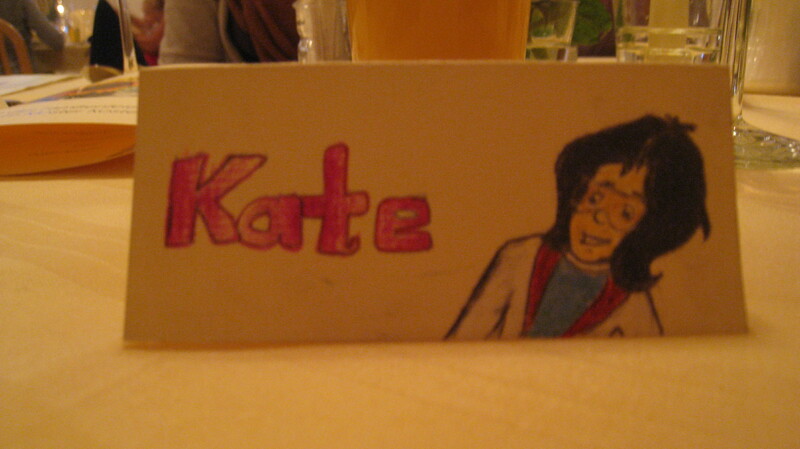 As you can see, my place card features an impressively sketched cartoon lady. Without schooling in German children’s entertainment, this particular choice may seem incidental. I immediately recognised the lady and her significance however. She is Karla Kolumna, a character in a German cassette series about a little witch called Bibi Blocksberg. Karla Kolumna is an eccentric and formidable reporter, who documents Bibi’s escapades and magical mishaps. My little, wonderful cousins had remembered both my fondness for Bibi and my journalistic aspirations. I couldn’t have been placed at a better table. As soon as everybody was seated, the waitresses appeared with the starter (riveta-type bread with a selection of herbal dips). They were in traditional Bavarian barmaid attire, with low-cut diandels and had a friendly brusqueness to them. After the starter, they came back to the table with their notepads and turned to each person in turn with the question “Fish or Pork?” I was a little scared to ask them for a vegetarian option after Onkel Fritz reaction to my dietry requirements. “I’ll do it”, whispered my sister, ever a life-saver. They did wonders for me and presented me with a glorious platter of “vegetable bags”. Before we tucked in however, a glass began to clink. Silence descended upon the room. Tante Renata got up and recited the first poem of the evening: an ode to Tante Rosemarie and a chronicle in verse of her life in Bavaria and subsequent move to Greece (like my mum, she married a man from abroad and moved to his country). The recital featured Rosemarie’s children (my cousins who had produced the nametags) teaching the whole Schultz clan isolated Greek words, which we repeated in unison enough times for the children to give our pronunciation the thumbs up. As I was tucking into my vegetable bags (or Gemuse Taschen) I had a sudden sinking feeling: I had forgotten to pick up the bag of black sausages!. “Do it now, quickly”, urged my sister. I took her advice and glided off toward the side door and into the corner of the little room, where I found them in a heap. I was just in time. 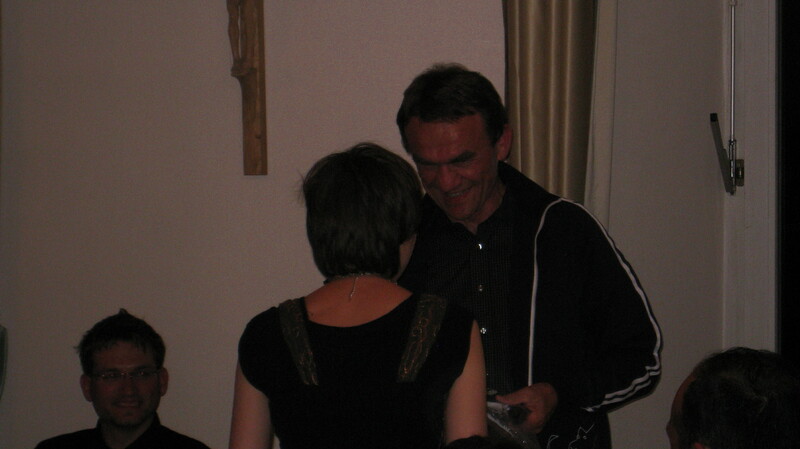 Dinner was wrapping up and Onkel Fritz was on his feet. Ever the gruff man in the face of ethical conceit, he had chosen to structure his speech around Onkel Gideon’s concern for the environment and in particular for energy efficiency. Gifts 1-6, which were presented by various members of the Schultz clan – including the youngest, at just under two- followed this theme exactly. Onkel Gideon received a solar-panelled radio, two metal devices which created a flame when rubbed together at a precise angle, a running jacket with the name of the house the nine Schultz children grew up in and a torch. Gidi, as we call him, is a keen marathon runner. Onkel Fritz, who crunches numbers and calculates meat profits for a living (I think anyway) had managed to work out exactly how much energy the average marathon runner exerts and had weighed the bunch of black sausages to match the calories burned. I presented these to a beaming Gideon and to much applause. 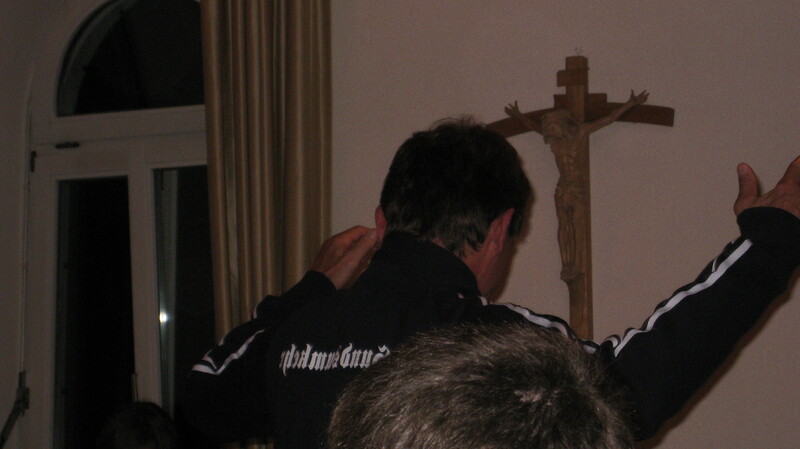 Pop by again soon for the Schultz Family Mass and perhaps a post- prandial trip to the Bavarian Glassman’s House. This entry was posted in Columns, Features and tagged birthdays, cousins, Familienfest, family, Life, Vegetarian by Kate Katharina. Bookmark the permalink. Wow, I love reading your posts about the Familienfest. Really great style of writing. Ever thought about writing novels? If you ever release a book let me know 😉 Greetings from Erlangen.